Winner of NBC’s LAST COMIC STANDING in 2015, Clayton English was recently named a New Face at the Montreal JFL Comedy Festival. Clayton made his late night standup debut on LATE NIGHT WITH SETH MEYERS and will be featured on the upcoming season 2 of LOVE (Netflix). 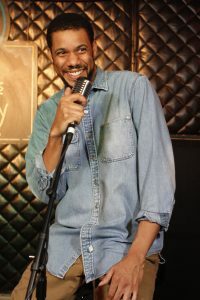 Clayton English is also known for his roles as Peanut on Tyler Perry’s House of Payne as well as Terrence from the film The Preacher’s Kid and Johnathan in Five Days in the A.
English started making waves in the comedy business with his stand out performances on BET’s Hell Date and TV ONE’s Bill Bellamy’s Who’s Got Jokes. His talent is not limited to the big and small screen. His stand-up routine has taken him from Atlanta to London. His performance’s are not to be missed he is truly one of the rising new faces in comedy. Clayton is from Atlanta where his friends know him as the “Prime Minister of Atlantsterdam.” Most recently Clayton has been touring with the UniverSoul Circus as their Ringmaster!